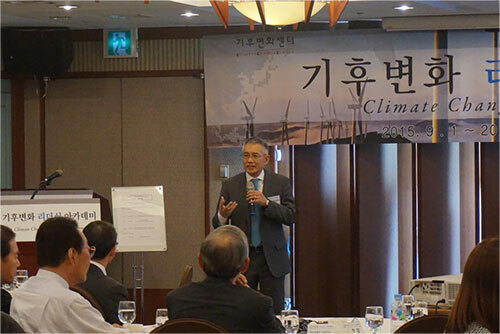 Seoul, South Korea, 25 September 2015 - Double A’s Senior Executive Vice President Mr. Thirawit Leetavorn has delivered a special lecture on sustainable way of doing business at the Climate Change Center (CCC)’s Climate Change Leadership Academy 2.0, which was held on 22 September 2015 at the Press Center. The Climate Change Leadership Academy is an educational program founded by the CCC in 2008 in Korea to discuss domestic and global climate change issues in conjunction with advanced studies of humanities, politics and economics. The Climate Change Leadership Academy participants include Mr. Kim Myungjeon, Vice President of Ernst & Young Korea; Mr. You Seungjik, General Manager of Green Gas Information Center; Mr. Sungho Lee, Director of Economy of The Foreign Office; and 30 other decision makers from government and industry sector. During the special lecture, Mr. Leetavorn has presented ‘Sustainability in Action, Better Paper Better World’ which covered the sustainable and environment-friendly way of producing paper. In order to escape the dilemma of environmental destruction that is associated with the paper industry, Double A has introduced the Paper from KHAN-NA model or the planting of trees in between paddy fields. Over 100 million trees are planted in this manner, thus ensuring sustainable and legal sourcing of materials, and no trees from natural forest are logged or used in Double A’s production. Paper from KHAN-NA also provides additional income to farmers for growing the trees on their unused land. Mr. Goh Kun, Head of Operations of Green Asia, also gave a special lecture on South Korea’s 10-year reforestation plan as a success study and presented solutions to successfully carry out North Korea’s 10-year reforestation plan with consistent, groundbreaking international cooperation as well as cooperation between South and North Korea. The Climate Change Leadership Academy 2.0’s 7-week program started on 1 September and will continue until mid October 2015.